Annual Turkey Giveaway today at the Oscar De La Hoya Ánimo Charter High School to lend a helping hand to East Los Angeles families as they celebrate Thanksgiving this year. The Foundation served turkeys to 600 families today and distributed an additional 150 turkeys to local organizations, churches and Green Dot Public Schools. 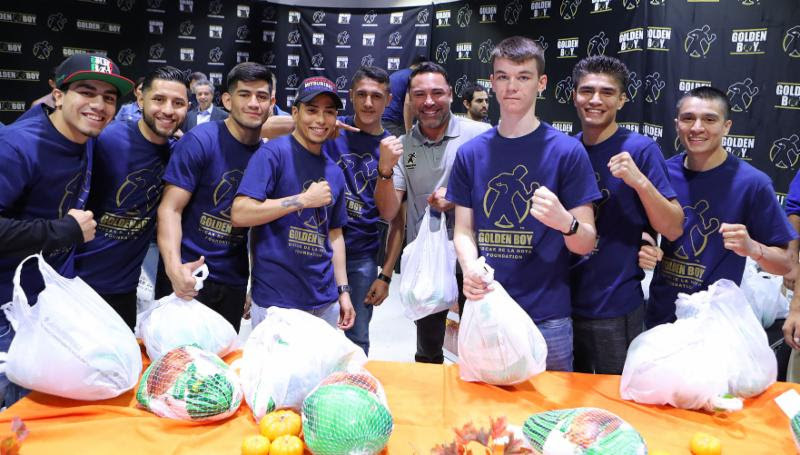 Golden Boy Promotions fighters Christian “Chimpa” Gonzalez, Abraham “Chamaco” Lopez, Alexis Rocha, Tenochtitlan “T-Dog” Nava, Edgar “Kid Neza” Valerio, Aaron “Silencer” McKenna, Joet Gonzalez and Jousce Gonzalez were all on site to help distribute food to the families in attendance. In 1995, Chairman and CEO Oscar De La Hoya started his honorable OscarDe La Hoya Foundation to help improve the quality of life for the community in his hometown of East Los Angeles. Today, with the help many partners, the foundation serves thousands of people annually. The Oscar De La Hoya Foundation supports the Oscar De La Hoya Ánimo Charter High School, the Cecilia Gonzalez De La Hoya Cancer Center and the Oscar De La Hoya Labor and Delivery Center and Neonatal Intensive Care Unit (both located at White Memorial Hospital in Los Angeles) in addition to various after school programs that promotes positive lives, and protect youth from the circumstances of living in underprivileged communities. The was made possible by Guerrero/Mission Foods, 4 Earth Farms, Delori Products, Tropicana, Jarritos, Nestle and Tampico.